SCVHistory.com | Tataviam Culture | Human Remains Encountered During Construction: Hyraulic Research, Valencia, 10-11-1968. 25200 Rye Canyon Road (later HR Textron, later Woodward HRT). The burials were likely associated with the major Tataviam village of Chaguayabit at Castaic Juntion (today's junction of Interstate 5 and Highway 126), whose inhabitants were removed by Spanish soldiers mainly in 1802 and taken to the San Fernando Mission. The identity of the Tataviam people was not well understood by news reporters in 1968. The skeletal remains and artifacts found at the Hydraulic Research site in nearby Rye Canyon were reportedly taken to the Southwest Museum. "Valencia Valley" was the name The Signal was using for the Santa Clarita Valley in 1968. Probe Starts in Discovery of Skeletons. Los Angeles Times | Saturday, October 12, 1968. Sheriff's homicide detectives were investigating the discovery Friday of two human skeletons at an excavation site in Saugus. The bones, said by officers to be possibly the remains of Indians buried at the turn of the century, were found in a grave 8 feet deep at 25200 Rye Canyon Road. The coroner's office was examining the bones. The discovery was made by Robert J. Barillier, 46, of 3942 Abella St., La Crescenta, a construction employee for Hydraulic Research Co., Burbank, who was working on a sewer line. Uncover Skulls at Valencia Site. Valley News | Sunday, October 13, 1968. 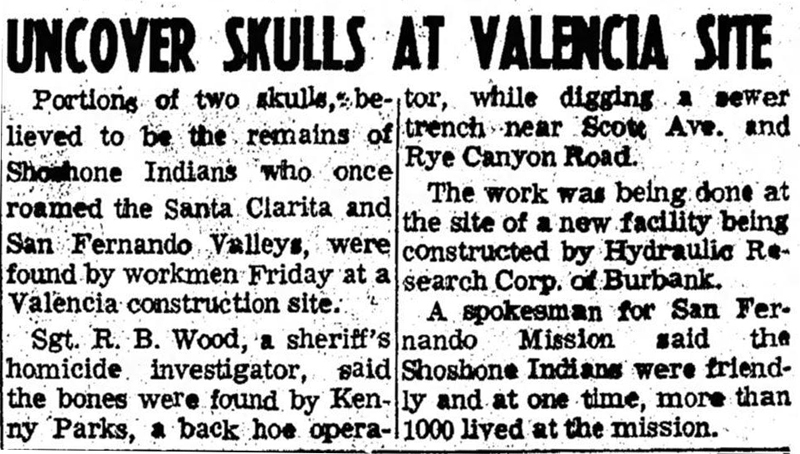 Portions of two skulls, believed to be the remains of Shoshone Indians who once roamed the Santa Clarita and San Fernando Valleys, were found by workmen Friday at a Valencia construction site. Sgt. R.B. Wood, a sheriff's homicide investigator, said the bones were found by Kenny Parks, a back hoe operator, while digging a sewer trench near Scott Ave. and Rye Canyon Road. The work was being done at the site of a new facility being constructed by Hydraulic Research Corp. of Burbank. A spokesman for San Fernando Mission said the Shoshone Indians were friendly and at one time, more than 1,000 lived at the mission. News story courtesy of Jason Bryce. A Lost Indian Burial Ground? The Signal | October 14, 1968. A Valencia Valley construction worker was startled Friday when he uncovered human skeletal remains while digging a trench in the Valencia Industrial Center. Robert J. Barillier of La Crescenta was in the midst of digging an eight-foot trench at the Hydraulics Research plant when he came across what appeared to be the skeletons of two adults. Sheriff's detectives were summoned to the scene and immediately launched an investigation into what might have been a possible homicide. However, preliminary reports indicate that the bones are likely from an old Indian burial ground used around the turn of the century. The discovery of burial grounds is relatively unusual, although they do turn up about once a year or so at big construction projects, Lieutenant Harold White of the homicide division said. The skeletons here were discovered about eight feet under the ground where the cafeteria of the new plant is being built. Lieutenant White reported that a final report from the coroner's office is expected this week. The Signal | October 16, 1968. Hydraulics Research spokesman William Summers yesterday said that there could be quite a few more than the three skeletons discovered last week yet to be dug up under its new Valencia industrial center factory site. Summers said that the coroner's office has now definitely decided the three skeletons uncovered last Friday were apparently part of an Indian graveyard, at least 50 years old. Most likely they were Shoshone Indians, said Summers, who explained that around the turn of the century more than thousands of them lived at the San Fernando Mission. Two skeletons were discovered Friday by trench machine operator Robert J. Barillier about six feet under the foundation for what will be the firm's factory cafeteria. A third was discovered Saturday. Further digging was scheduled to begin late yesterday or today. The skeletons discovered so far were in a fetal position, which is the way the Shoshone Indians buried their dead. The bones are currently at the coroner's office. But Summers said the coroner's office has said they will return them to the firm that then intends to donate them to a local university. The Signal | October 18, 2018. William Summers has launched a major investigation into the deepening mystery of the Indian graveyard uncovered last week under what will be the foundations of a cafeteria of a new 180,000 square-foot factory in Valencia Valley. Normally just a mild-mannered industrial relations expert with the Hydraulics Research company, Summers yesterday admitted that he had become intrigued with the origin of the three skeletons uncovered in an apparent grave by Robert J. Bariilier, superintendent for the construction firm building the new Hydraulics Research plant in the Valencia industrial center. Admitting that he had always been fascinated with ancient [illegible], Summers said since being assigned the task of handling the bones he has become determined to find out the whole story. And one of the first things he learned was that they may well belong to an Indian tribe dating back before the arrival of the white man many hundreds of years ago. Originally, after homicide detectives turned the bones over to the coroner's office after deciding murder was not involved, Summers had learned that the skeletons probably belonged to some Shoshone Indians from around the turn of the century. About a thousand of them used to live near the San Fernando Mission, he said. But now, he said, there is a possibility that this is not the case, and the skeletons are from a much more exotic background than that. Summers plans to conduct a thorough investigation into the matter, before the bones are hopefully turned over to a museum or university. Mysterious Bones: The Newest Theory. The Signal | October 23, 2018. 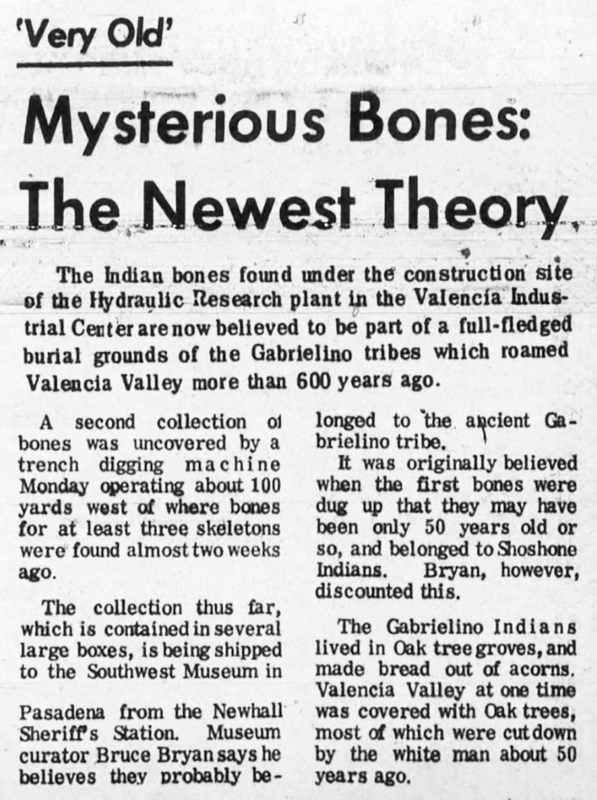 The Indian bones found under the construction site of the Hydraulic Research plant in the Valencia Industrial Center are now believed to be part of a full-fledged burial grounds of the Gabrielino tribes which roamed Valencia Valley more than 600 years ago. A second collection of bones was uncovered by a trench digging machine Monday operating about 100 yards west of where bones for at least three skeletons were found almost two weeks ago. The collection thus far, which is contained in several large boxes, is being shipped to the Southwest Museum in Pasadena from the Newhall Sheriff's Station. Museum curator Bruce Bryan says he believes they probably belonged to the ancient Gabrielino tribe. It was originally believed when the first bones were dug up that they may have been only 50 years old or so, and belonged to Shoshone Indians. Bryan, however, discounted this. The Gabrielino Indians lived in oak tree groves and made bread out of acorns. Valencia Valley at one time was covered with oak trees, most of which were cut down by the white man about 50 years ago.